appeared In the A-14 Section of \”Evening Tribune San Diego, Saturday, April 6, 1968. [You and YOUR PROBLEMS] by Richmond Barbour. According to the husband, he and his wife were standing under the Mt. Helix Cross, just after midnight, and under a full moon. The very clear sound of a sobbing woman could be heard by both husband and wife. They proceeded to search the entire mountain top but found no one. They were alone and the crying continued to be heard. Then both witnessed the figure of a woman walking slowly down the steps. The husband ran to her but as he approached the figure dissolved into thin air. Newspaper columnist Richmond Barbour dismissed the sighting as the effect of wind and over active imaginations. [c1][q1][a1]The following information comes from the November 4,2010 \”Mount Helix Patch\” Article Titled \”Is There a Ghost on Mount Helix?,\” by author Eric Yates. http://lamesa.patch.com/articles/is-there-a-ghost-on-mount-helix#photo-2853624 Eric Yates was very kind to allow San Diego Haunted Full citable rights. [c1] On Oct. 29, 2010 S.D.G.H set out to investigate the park and amphitheater. According to the article Sharon (last name with held), witnessed on three separate occasions (two on the mountain itself) the apparition or ghost of a mid-20\’s female. 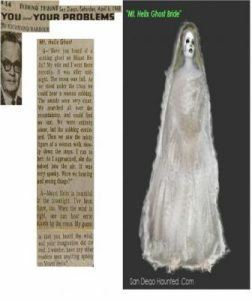 Remarkably Sharon witnessed the apparition (October 1968) only months after the reported article took place. [q1]\”I had gone walking around by myself and was sitting on a wall looking at lights of the towns below. I remember it was still warm even though it was fall,\” said Sharon. \”All of a sudden this wind picked up, and I felt this energy. She added that, judging from the ghost\’s appearance, she wasn\’t \”from our time,\” and described her dress as Victorian. Sharon said that the apparition was within an arm\’s length of her and lasted for several minutes. She added that she was not scared, only startled because the spirit appeared so quickly, and she felt an almost electric energy. [a1]Sharon herself says she has had two more encounters with the same spirit—one in 1970 on Mt. Helix in similar circumstances as her first, and a third while driving to her home on Greenfield Drive in El Cajon in 1975. What is the Ovilus device? and why is it controversial? The idea behind the Ovilus is that a ghost, spirit can manipulate external variables such as magnetic fields and temperature to drive an electronic word database. The company that produced the original device sold it as (intended it to be) a novelty item. Use of the device is highly controversial. There is no science to support the device\’s use. If a ghost could manipulate the environment to drive a word database, then one should reason a spirit would be able to achieve easier feats of communication. The park is now only open to the public from sunrise to sunset. Those seeking to investigate the paranormal claims will be limited at best. One Response to "Mount Helix cross mt ghost haunt spirit cry La Mesa ghost bride"